The original Q.U.B.E. began as a student project back in 2010. With help from the Indie Fund, developer Toxic Games was able to bring the game to PC in 2012 before bringing it to other platforms. An acronym for Quick Understanding of Block Extrusion, players are tasked with using a glove to allocate different colours to blocks to give them different properties and allow players to escape from the room. In 2015, Q.U.B.E. Director's Cut was released on Xbox One with additional puzzles, a time trial mode and a deeper narrative. 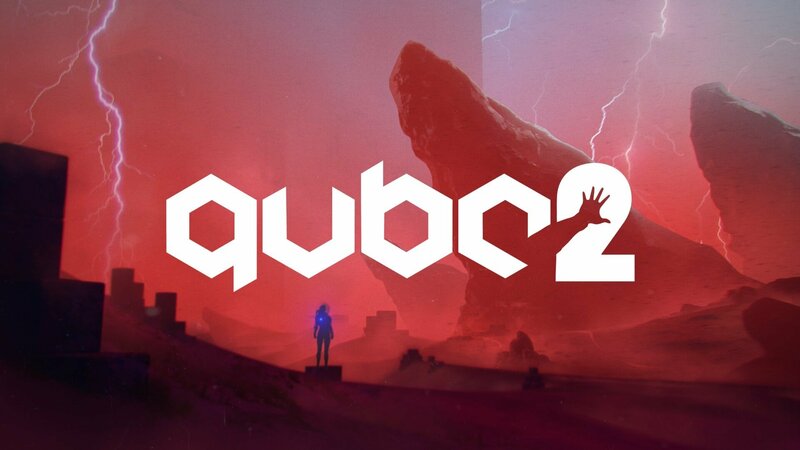 Now a sequel, Q.U.B.E. 2, is on its way to Xbox One and Windows 10 and it seeks to improve upon the first title in every way. Before the Director's Cut of Q.U.B.E. was released, it was purely a puzzle game. Little narrative existed and it was very much a solitary adventure through the puzzle chambers of a space ship. Q.U.B.E. 2's narrative is more extensive, taking players on a new journey with new characters. In the role of Amelia "Milly" Cross, you wake up on an alien planet with no idea where you are. Another survivor, Emma, contacts you and urges you to explore a new cubic structure to find her and a way of getting off the planet. 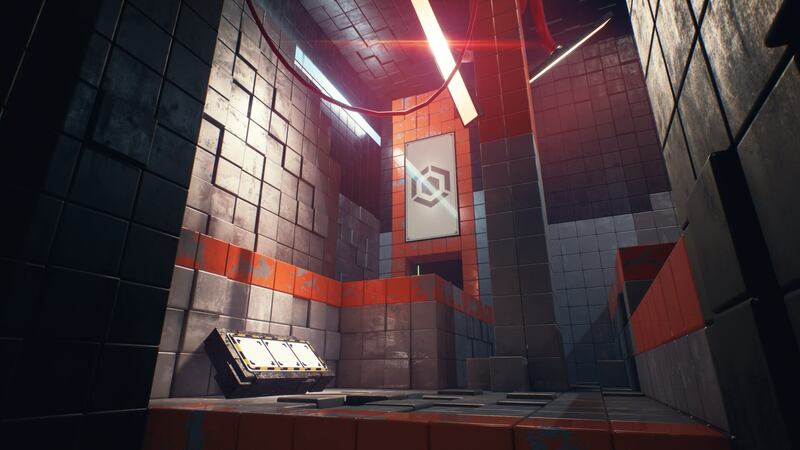 Toxic Games has made use of Unreal Engine 4 for their upcoming title and the difference in graphical quality is obvious from the start of the demo. The minimalistic, sterile scientific laboratory vibe has disappeared and the new environment feels far more ominous thanks to improved lighting effects. Players begin in a small side chamber with a single entrance leading into a dilapidated dark corridor. A giant red pipe leads the way down an uneven staircase. The flat surfaces and colours of the first game's environment are nowhere to be seen; in fact, the floors are so full of trip hazards that a health and safety official would have conniptions. Lasers stop players from straying off the straight and narrow before they climb the steps to a mysterious door. It isn't just one door, though; door after door retracts into the ceiling to reveal a long corridor into the first chamber. Emma encourages you to use the blue colour that is coursing through your suit and into your palm to alter one of the two blocks on the floor in front of you. This turns it into a launch pad that will propel you towards higher ledges. Further along you gain the red colour, which turns a square into an extendable platform. Players also encountered a green colour that generated a block that fell out of the wall and could be manipulated to a more convenient place. Unlike Portal — with which it's impossible not to make a comparison — where players can put a portal wherever they please, only certain designated blocks can be manipulated in a room. While there are only three colours in this game compared to the five in the original, the challenge remains in finding the right combination of mechanics to get out of the room you're in. Eventually, Milly emerges into an outdoor environment. In the middle of the space is the unexpected sight of a red-leaved tree. As Milly states: "there's life here, there's water and plants". Later on in the journey, spaces like these will serve as hubs with adjoining puzzle rooms. If players become stuck on a puzzle, they can choose to leave a room and enter another to try a different puzzle in the meantime. The game's general formula may not have changed too much from that of Q.U.B.E., but there's always a danger that if you change things too much, the game loses touch with what made the franchise great in the first place. Toxic Games seems to be sticking to this idea, innovating as much as they can without leaving the game's fans behind. 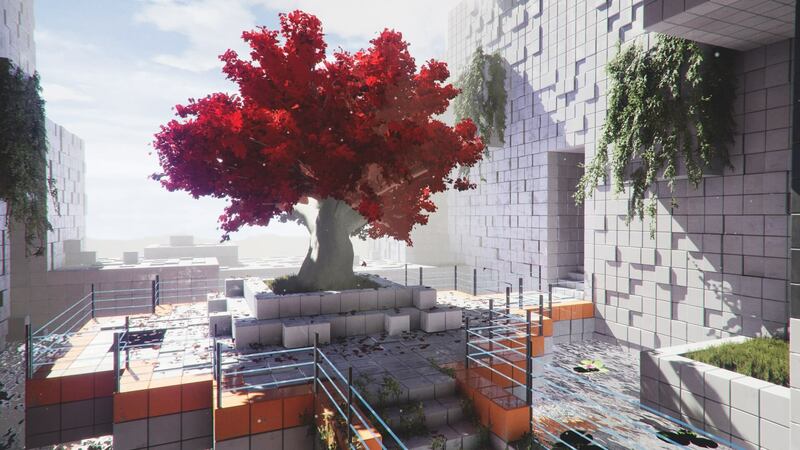 If you're currently enjoying November's TA Playlist title, The Turing Test, and are looking for other titles in the same genre, I'd recommend you check out Q.U.B.E. 2 when it's released early next year.